If your boat has a Raritan Engineering PHII or PHEII marine toilet and you have leaks around the piston rod assembly, you may need to replace the O-rings on this assembly. 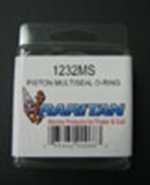 Boatersland has Raritan 1232MS Piston O-rings in stock at low prices for this quick maintenance project. If you need Raritan repair parts, look to Boatersland for the lowest prices on these high quality parts.